The concept of “ending homelessness” has been central in public policy and service responses in recent years. Just consider the number of plans, strategies, policy directions and funding announcements to end homelessness - not just in Canada, but internationally. However, there is no consistently recognized definition of what an end of homelessness looks like. There is no agreement as to what the indicators and targets should be confirming such an achievement, nor a process to verify whether communities have met their goals. 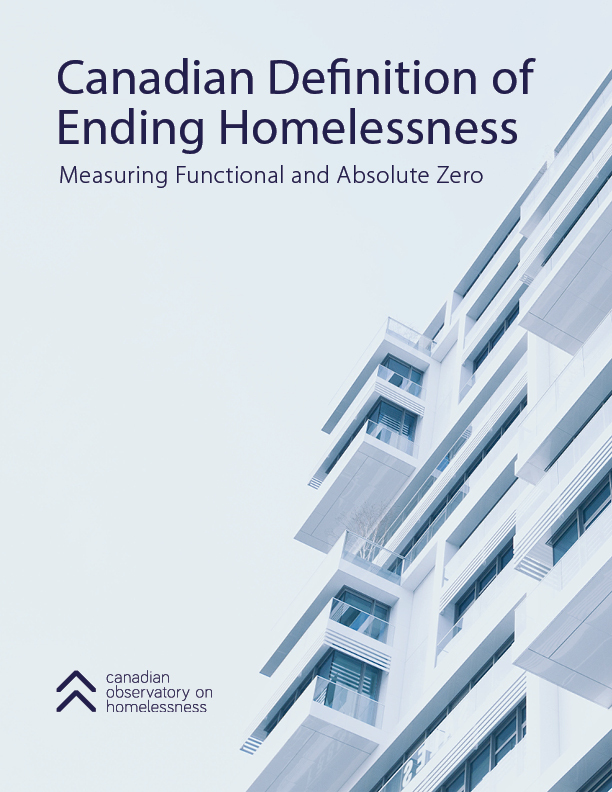 To this end, the Canadian Observatory on Homelessness (COH), the University of Calgary School of Public Policy (SPP), and the Canadian Alliance to End Homelessness (CAEH) supported a collaborative process to develop a definition of what it means to end homelessness in Canada. This comprehensive process included a review of 60 jurisdictions and consultations with people with lived experience, service providers, researchers and policy makers. This document is an overview of the definition, which is founded on the concepts of Functional and Absolute Zero.